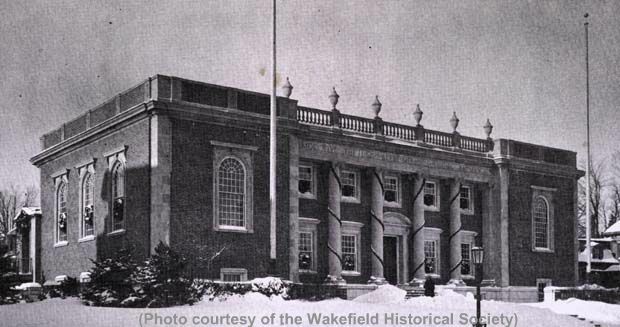 "After more than 50 years at the Wakefield Town Hall at the corner of Main and Water Streets, the library moved to a new home in April, 1923. The town's first official library was established in 1856 at the old Town House on the Common. Soon after the Town Hall was built, the library was moved and renamed the 'Beebe Public Library' after a $500 donation from Library Board Chairman Lucius Beebe. In 1916, $12,000 was raised by local residents, many of whom were children, to purchase the land at Avon and Main Streets. Junius Beebe subsequently donated the funds to build a new library in his parent's memory. Construction on the library was delayed until the end of World War I. An addition to the original building was completed in September, 1969." -- Text from calendar by Jayne M. D'Onofrio. “Lucius Beebe Memorial Library, January 1934,” NOBLE Digital Heritage, accessed April 22, 2019, https://digitalheritage.noblenet.org/noble/items/show/7012.